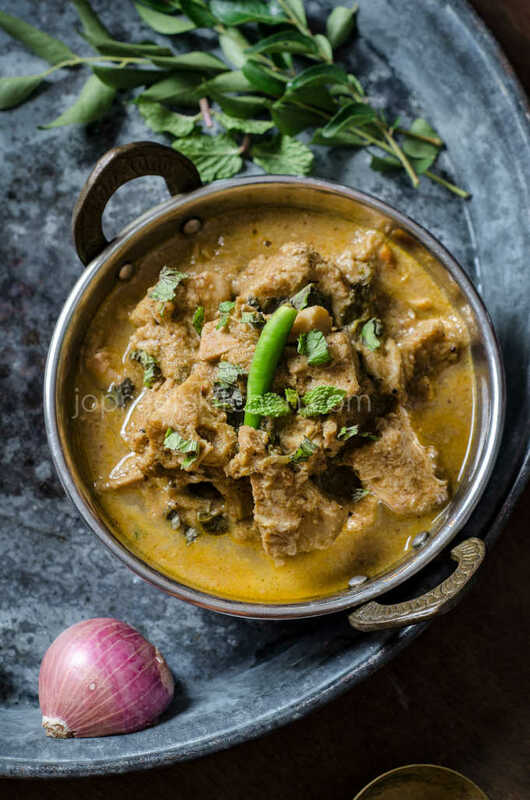 Kongu Style Palakkai Kuzhambu / Kathal Curry, today I’m sharing one of my favorite curry made from raw jackfruit / kathal which is coconut based and also vegan. The cleaning part is what always bothers me. Once you get hold of this part, cooking is very easy. 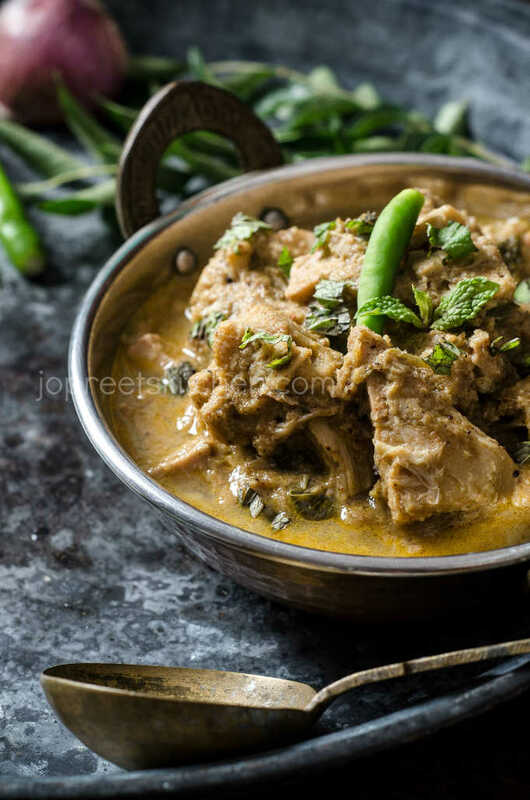 This vegetable after cooked looks similar to mutton. This is a fleshy vegetable which also possess healthy benefits. 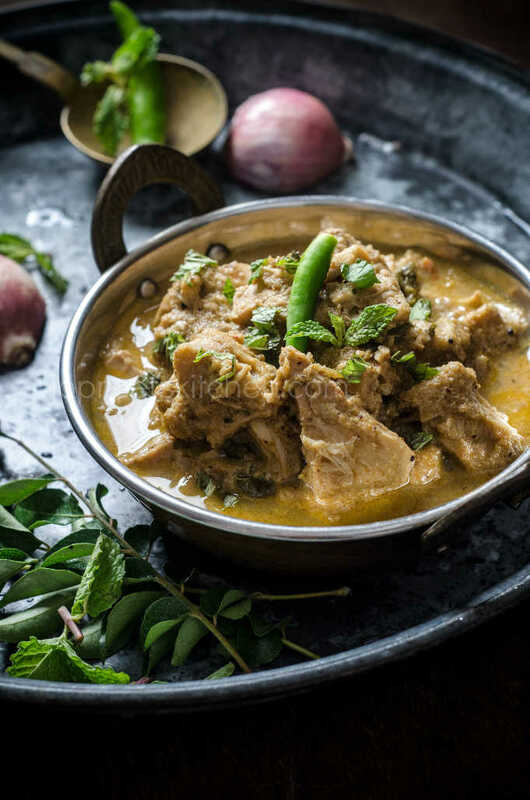 You can either prepare this curry fully in pressure cooker or follow the method mentioned below. Instead of pressure cook, you can add those pieces along with the ground paste and cook for longer time but it sure takes more time. The key ingredient in every kongu style curries is coriander powder which is made from coriander seeds, dry chilies, curry leaves and garlic. I had already one version which is easy. I shall soon share the another version which requires 4-5 ingredients to prepare coriander powder. 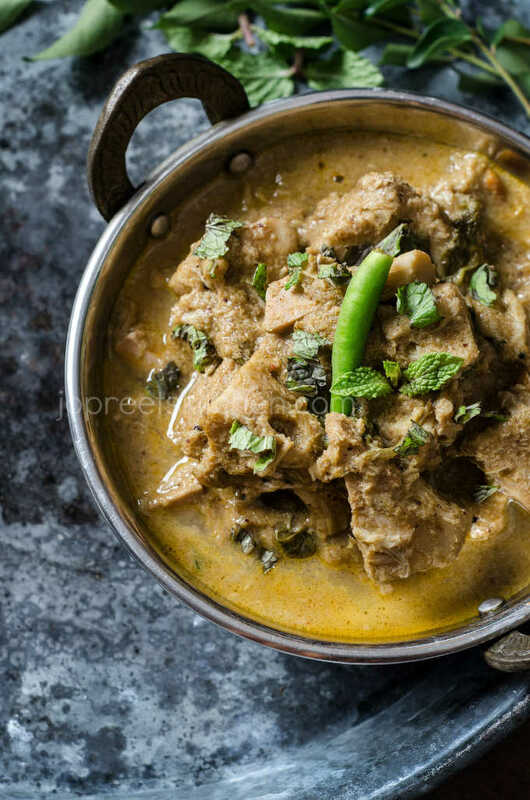 This curry goes very well with rice and roti. To prepare slightly thin curry, add more water and adjust the cooking time accordingly. Apply coconut oil over your hands and knife. Remove the skin and cut jackfruit into small pieces. Put those pieces in water to avoid brown coloring. Out of 580 gms baby jackfruit, I got only 400 gms after cleaning. Heat a pressure cooker and add washed jackfruit pieces along with little salt and turmeric powder. Pour enough water till the pieces submerges. Close the lid and pressure cook on low-medium flame for 1 whistle. Remove from the heat and let the pressure settle down. Drain the water completely and keep those cooked pieces aside. Heat 1 tbsp oil in a pan. Temper mustard seeds, fennel seeds and curry leaves. Add chopped onions and saute a while. Now, add coconut pieces and cook till it turns golden brown. Remove from the heat and allow to cool. Grind in a mixer along with 2 tbsp coriander powder. Add 1 or 2 tbsp water and blend till you get smooth paste. Keep it aside. Heat 2-3 tbsp oil in a pan. Add chopped tomatoes and green chilies. Mash the pulp. Add mint leaves and saute a while. Add ginger-garlic paste and stir well. Add ground masala paste, red chili powder and coriander powder. Stir well everything and finally add cooked jackfruit pieces. Mix well everything and add 2-3 cup water. Add more water if needed and cook it covered for 15 mins. Now, add garam masala and salt to taste. And cook it covered for another 15-20 mins on low flame till raw masala smell goes and you get thick curry. Serve this with rice or roti. This is so delicious. Looks like a restaurant dish. Superb and Sweet Blog,So Delicious…keep write us. Avoiding tomato will be a good option.